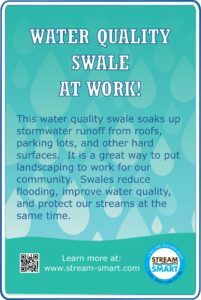 Stormwater runoff is flow that is generated from rain or snow that falls on hard surfaces (e.g., roof tops, driveways, roads, and parking lots). The flow (runoff) generated from these surfaces enters local streams, rivers, canals, and drainageways during and immediately following a storm event instead of soaking into the ground. This causes a problem because the ground can no longer act as a sponge absorbing water or filter pollutants. As a result, more water and dirtier water enters streams and rivers quicker resulting in flooding, erosion, and degraded water quality. The photo below illustrates the impacts of the urban environment on runoff. Stormwater can pick up debris, chemicals, dirt, and other pollutants and flow into a storm sewer system or directly to a lake, stream, river, wetland, or coastal water. Anything that enters a storm drain is discharged untreated into the waterbodies we use for swimming, fishing, and for providing drinking water (EPA 2003). As a result, anything that enters storm drains in the Bear Creek Watershed can flow into Bear Creek to the Rogue River to the Pacific Ocean. It’s all connected! 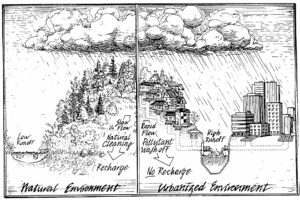 Managing urban runoff from stormwater is regulated under the Clean Water Act. As of January 2017, the communities of Medford, Ashland, Phoenix, Talent, Central Point, and Jackson County need to meet the requirements of the NPDES Phase II Program. In late 2017, it is anticipated that many other Rogue Communities including Grant Pass, Rogue River, Eagle Point, and Josephine County will have to meet the requirements of the Phase II program as well.